Figure 1. Olympic marmot. Photo by Rod Gilbert. The Olympic marmot is an endemic species, found only in the Olympic Mountains of Washington (Figure 1). It inhabits subalpine and alpine meadows and talus slopes at elevations from 920-1,990 m (Edelman 2003). Its range is largely contained within Olympic National Park. 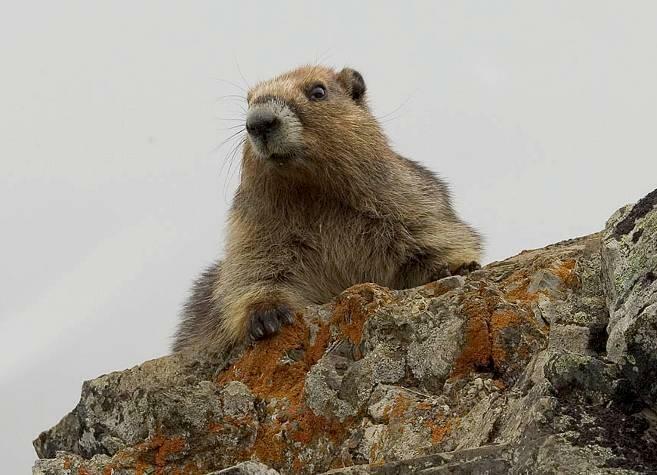 The Olympic marmot was added to the state Candidate list in 2008, and was designated the State Endemic Mammal by the Washington State Legislature in 2009. The Olympic marmot differs from the Vancouver Island marmot (M. vancouverensis), in coat color, vocalization, and chromosome number. Olympic marmots were numerous during a 3-year study in the 1960s, but in the late 1990s rangers began noticing many long-occupied meadows no longer hosted marmots. Olympic marmots differ from most rodents by having a drawn out, ‘K-selected’ life history; they are not reproductively mature until 3 years of age, and, on average, females do not have their first litter until 4.5 years of age. Marmots can live into their teens. Data from 250 ear-tagged and 100 radio-marked animals indicated that the species was declining at about 10%/year at still-occupied sites through 2006, when the total population of Olympic marmots was thought to be fewer than 1,000 animals. During 2007-2010, a period of higher snowpack, marmot survival rates improved and numbers at some well-studied colonies stabilized. Human disturbance and disease were ruled out as causes, but the decline was apparently due to low survival of females (Griffin 2007, Griffin et al. 2007, and Griffin et al. 2008). Annual survival of adult females during 2002-2006 was <70% compared to about 89% in the 1960s; this is lower than the population can sustain (Griffin 2007). Predation by coyotes was the most common cause of mortality (Griffin 2007, Witczuk 2007). Coyotes have reportedly inhabited high elevation areas of the Olympic Peninsula for around 60 years, but were rare or absent from the Olympics historically when wolves were widespread in western Washington (Taylor and Shaw 1929, Dalquest 1948, Scheffer 1995). The telemetry data indicated that about half the females and two-thirds of the males disperse at age two or three. The median distance traveled by 2 and 3-year olds was was 1,800 m for males, but only 305 m for females, suggesting that they may be slow to re-occupy vacant habitat patches (Griffin et al. 2009). The decline in the marmot population during the 1990s and early 2000s, followed by an increase in marmot survival in years with higher snowpack, suggests that coyote predation is affected by snowpack. If this relationship is confirmed, it indicates Olympic marmots will be affected by any decline in average snowpack resulting from climate change. Conservation activities. The National Park Service has supported Olympic marmot research and monitoring activities since 2002, including two University of Montana graduate research projects (Griffin 2007, Witczuk 2007) and a citizen science monitoring effort. Conducted since 2010, monitoring has involved more than 80 volunteers each year to check on occupancy of suitable habitat patches. The program is supported by Washington’s National Park Fund, Olympic National Park, and the U. S. Forest Service. In 2012, the effort involved 92 volunteers and expanded to include sites outside the park in Olympic National Forest (National Park Service 2012). Of the 351 survey units assigned, surveyors completely surveyed 279 and partially surveyed 32 units (Figure 2). Some units could not be surveyed due to above average late season snowpack. 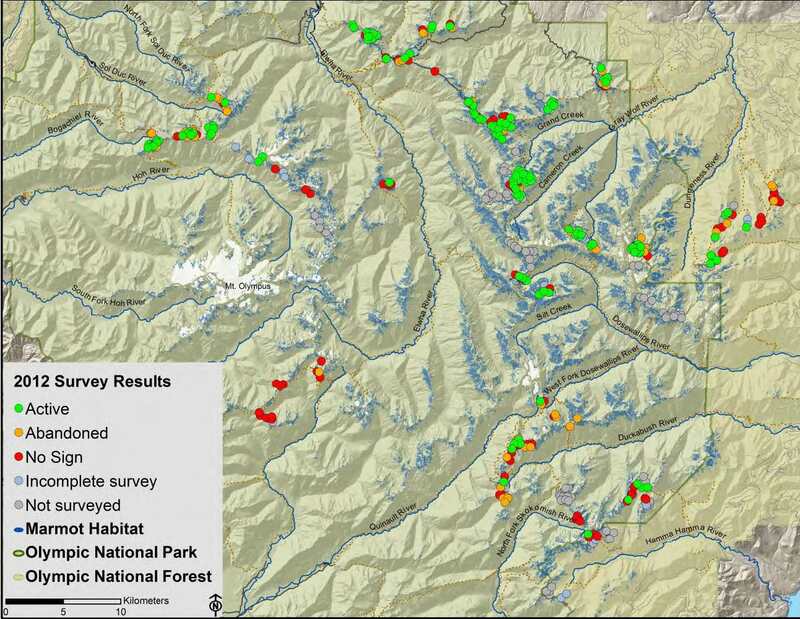 Of the 28 new units in Olympic National Forest identified from habitat modeling, 25% were occupied by marmots. Partners and cooperators: Olympic National Park, Washington’s National Park Fund. Dalquest, W. W. 1948. Mammals of Washington. University of Kansas, Lawrence, Kansas. Edelman, A. J. 2003. Marmota olympus. Mammalian Species 736:1-5. Griffin, S. C. 2007. Demography and ecology of a declining endemic: the Olympic Marmot. Ph.D. dissert., University of Montana, Missoula.190 pp. Griffin, S. C., M. L. Taper, R. Hoffman, and L. S. Mills. 2008. The case of the missing marmots: are metapopulation dynamics or range-wide declines responsible? Biological Conservation 141:1293-1309. Griffin, S. C., T. Valois, M. L. Taper, and L. S. Mills. 2007. Effects of tourists on behavior and demography of Olympic marmots. Conservation Biology 21:1070-1081. Griffin, S. C., P. C. Griffin, M. L. Taper, and L. S. Mills. 2009. Marmots on the move? Dispersal in a declining montane mammal. Journal of Mammalogy, 90(3):686–695. Scheffer, V. B. 1995. Mammals of the Olympic National Park and vicinity. 1949. Northwest Fauna 2:5-133. Taylor, W. P. and W. T. Shaw. 1929. Provisional list of the land mammals of Washington. Occasional Papers of the Charles R. Conner Museum 2:1-32. Witczuk, J. J. 2007. Monitoring program and assessment of coyote predation for Olympic Marmots. M.S. Thesis, University of Montana, Missoula, Montana. 75 pp.